Samsung are a big deal when it comes to electronics. Alongside their Galaxy S5 announcement, the Korean manufacturer challenged the fitness industry with a new range of smartwatches. Unveiling the Samsung Galaxy Gear 2, Galaxy Gear 2 Neo and the health focused Galaxy Gear Fit, all three wearable devices are capable of tracking heart rate and exercise. As Samsung have clear intentions of using wearable tech to improve your health, how does the Samsung Galaxy Gear Fit compare against the Garmin Vivofit? 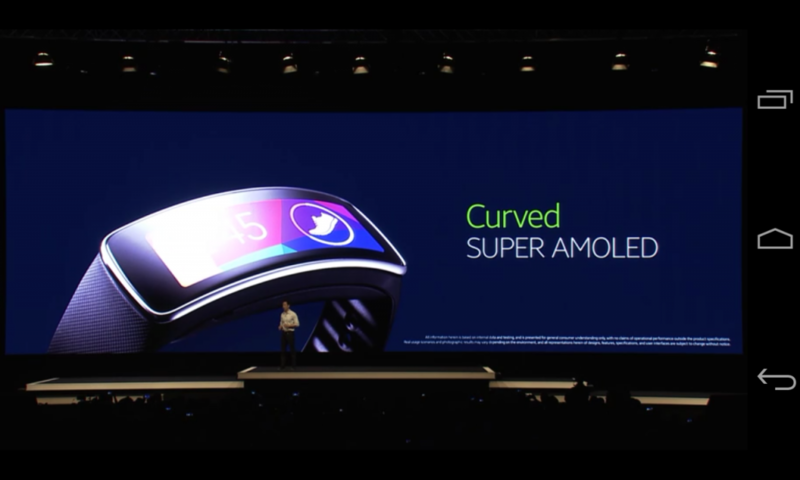 Can Samsung become a household name in the fitness band and activity monitor market? On the surface, both fitness trackers are worn on the wrist like a watch, easily the most natural and comfortable place to check your activity data in real-time. Both devices also offer a curved display, with the Galaxy Fit providing the premium choice of a 1.84 inch super AMOLED display that’s bursting with colour. The Vivofit is a more compact 1.17 inch display with limited colours but still remains eye catching. Comparing weights, both health bands are ultra light with the Vivofit weighing in at a super low 25.5 grams. 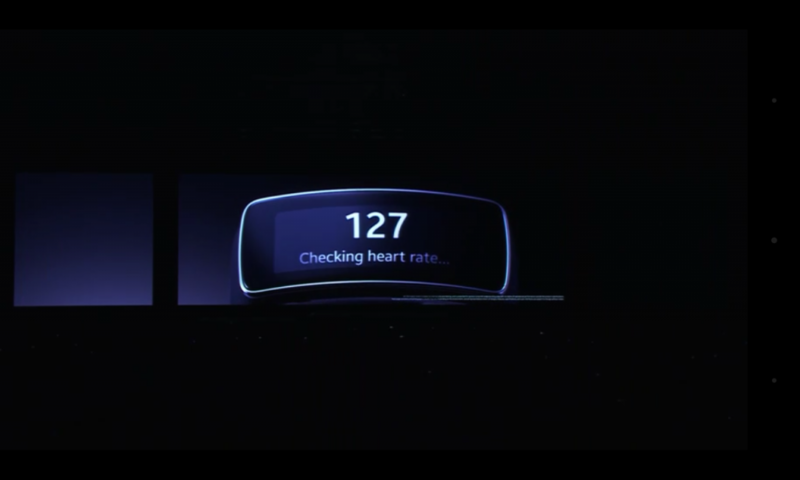 Samsung’s Gear Fit isn’t far behind at 27 grams but in fairness does include a larger curved display and the heart rate monitor all within the band itself. The inclusive HRM can be found on the underside of the device, ready to capture your pulse throughout the day. Must read: “Lazy alerts” and 4 other reasons why the Garmin vivofit will spring you into shape. With both health bands offering water resistance, there’s no need to worry about using your Garmin or Samsung tracker in the rain for a run. Though not waterproof, you can be assured both fitness bands will continue to track even if you get a little sweaty. Verdict: The Gear Fit has a more attractive and visually stimulating design than the Garmin Vivofit. What health trackers are on Samsung’s Gear Fit? Samsung’s smartwatch can effortlessly track steps taken using the inbuilt pedometer. This movement data can be used to provide an estimate of distance covered and calories burnt. As mentioned, heart rate is always easily attainable through the monitor on the underside of the tracker. Garmin’s Vivofit provides the same metrics, though heart rate will only be tracked whilst wearing the optional HRM chest strap. With no GPS tracking on the vivofit, steps taken is also used as an estimate of distance covered. Winner: The in-built heart rate monitor makes the Gear Fit a more versatile tracker for capturing resting heart rate and occupational fitness. Everyone loves to personalise and make their tech identifiable and fashionable. Both the Gear Fit and Vivofit can be easily taken out of their wrist straps and popped into an alternative colour in seconds. The Vivofit has announced 5 different colours of wrist strap that can be purchased separately (Black, Teal, Blue, Purple and Slate). 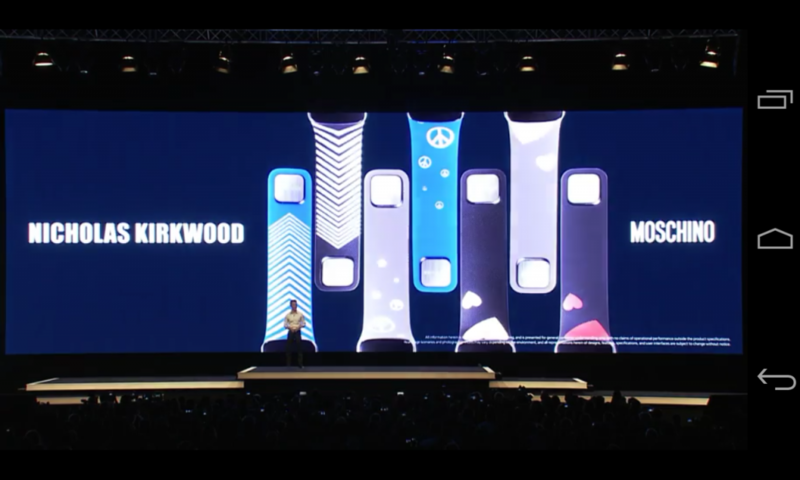 For true personalisation, Samsung’s range of straps offer cooler designs across a range of patterns and colours. With artwork from Nicholas Kirkwood and Moschino the vibrant designs prove that fitness trackers don’t need to look plain. The display on the Gear Fit can be further personalised with fashionable wallpapers; maybe a great place to display that motivational quote that really gets you moving. Winner: The Samsung Galaxy Gear Fit offers a greater range of personalisation. Exercising to your favourite tracks can be a huge motivator to keep you focused during your workout. If you exercise with your smartphone in your pocket, the Gear Fit watch lets you change music tracks with a touch using the media controller. It’s a great way to save unzipping your pockets and trying to handle your phone without the risk of dropping it. As the Garmin Vivofit doesn’t cater music options, the Samsung Galaxy Gear Fit is unchallenged with this feature. If you crave a fitness band which plays music without the need to pair up to another device, Samsung’s other newly announced wearables the Gear 2 and Gear 2 Neo offer 4GB of internal memory; that’s more than enough music storage to outlast your marathon effort. Winner: A no contest, Samsung Galaxy Gear Fit. All those extra features on the Galaxy Gear Fit such as music playback and viewing phone notifications will drain a significant amount of battery life from the fitness tracker. Samsung state the Gear Fit has a battery life of approximately 3 days so regular charging will still be required. Though this means less time on the wrist and more time hooked up to a power supply, the Galaxy health tracker could be charged up overnight and then used during the day. With the Vivofit providing all the core tracking features without big displays and music features, its distinct advantage against the Gear Fit is its ability to remain juiced up with battery for 1 year without need for a charge. This makes the Vivofit a clear winner if you want to track your lifestyle patterns holistically. Spending more time on the wrist, the Vivofit band can track your sleep patterns without you worrying about a flat battery in the morning. Winner: without a doubt, the Garmin Vivofit. Though fitness trackers are great for capturing activity data, the true magic happens when analysing your progression and health metrics on a larger display, usually from a smartphone. The Garmin Vivofit is compatible across the iPhone range and thanks to a recent app software update rolled onto Google Play, the fitness band can now connect to a range of Android smartphones too. 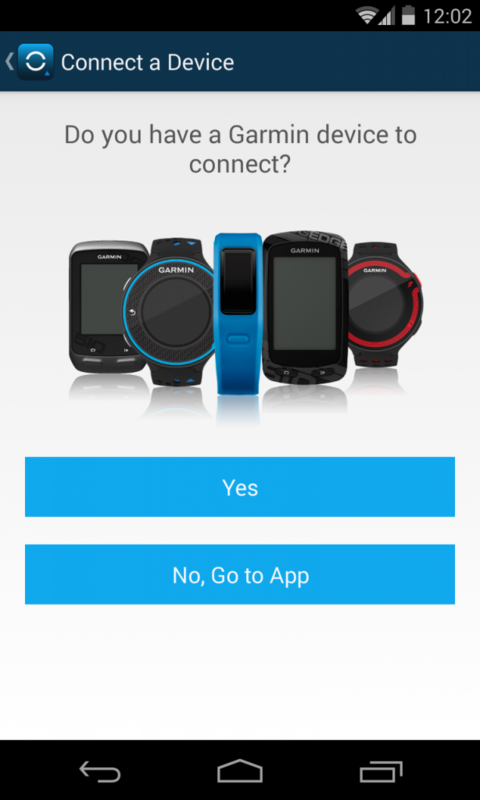 If you are keen for the Samsung Galaxy Gear Fit, you may want to check whether your smartphone is compatible. 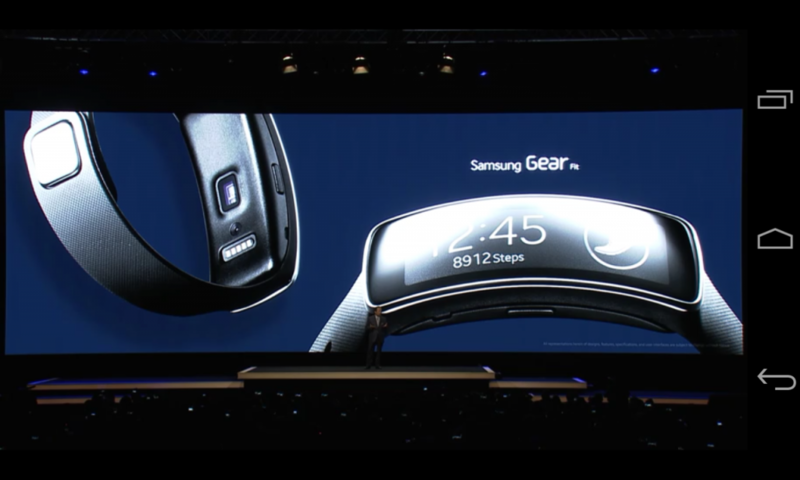 Samsung stated at announcement, the Gear Fit is only compatible with 18 existing Galaxy devices. Though Samsung smartphones are already in the hands of millions of consumers, Garmin’s fitness band will have more universal appeal due to compatibility with smartphones from other leading manufacturers such as Apple, Sony, and HTC. Winner – The Garmin Vivofit can be used across a range of smartphones from different manufacturers meaning you’re less restricted in choice when buying your next mobile phone. As two of the best fitness trackers for 2014, both releases will display data using their respective health apps. Garmin Connect is widely available across the iOS App Store and Google Play and has recently undergone an update to cater for activity tracked on the Vivofit. You can also view data from your desktop or tablet, meaning your stats are never out of reach. S-Health is the fitness software designed for the range of Galaxy smartphones. Previous to the release of the Gear Fit, S-Health could allow a user to input their food intake through scanning barcodes on their smartphone camera. Verdict: To be decided once both fitness apps have been tested. Both fitness bands are launched just days apart, with Garmin’s available from the 31st March 2014 and Samsung’s to follow from the 11th April. As for prices, we already know that the Garmin Vivofit is available to pre-order from £99.99 . Initial release day prices for the Fit are priced around $225 which is reasonable value for the extra connectivity you get. 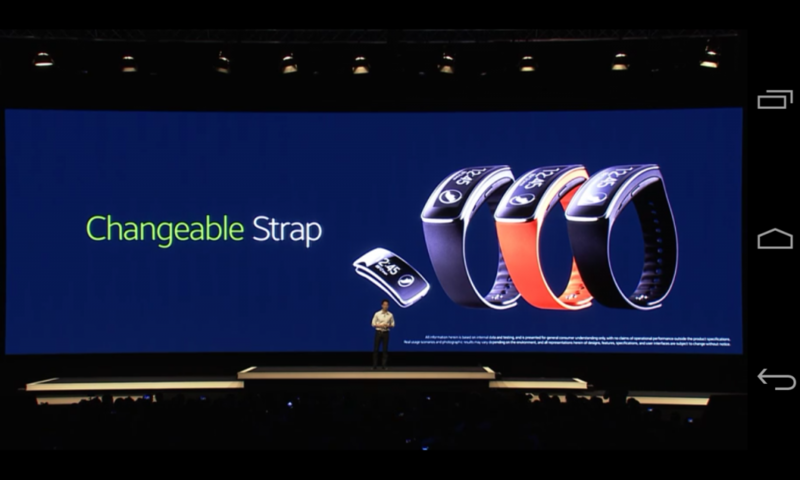 At a first glance, Samsung’s Gear Fit may seem overpriced compared to the the Vivofit. It’s worth remembering the heart rate monitor on the Vivofit is sold in a bundle pack worth £139.99. The inclusion of a heart rate monitor and beefed up specs such as a clearer, more colourful display and the ability to reject calls, mean the Galaxy Fit may make the higher price of the Galaxy Gear Fit justifiable to those who purchase it. If you’re looking for a widely available health and fitness tracker that’s compatible with the majority of smartphones, the Garmin Vivofit is a wise choice for those who seek affordability from their wireless fitness tracker. The extensive battery life, ability to track sleep patterns and water resistance make the Vivofit great for tracking your entire lifestyle without the need to ever take it off. If you own a Samsung smartphone, then the Galaxy Gear Fit may be worth the extra cost. If you demand a sleek and premium fitness tracker that’s loaded with additional features and higher specs then the Fit certainly has its advantages over the Vivofit. 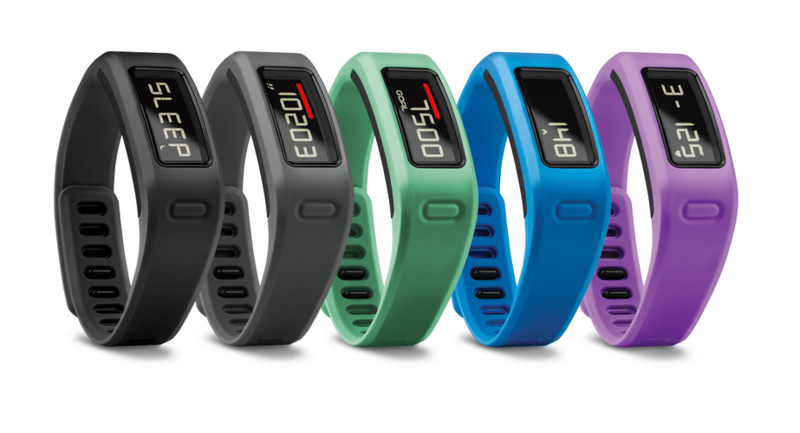 Whichever fitness band you decide to track your health in 2014, your physical activity has never been so easy to monitor.